My first 3-year inspection plan was published in 2016, since when I have updated it each year. My aim in publishing a rolling 3-year plan was to provide a better sense of the overall shape and range of ICIBI’s work programme, how planned inspections fitted together thematically, and to signpost when particular topics would be examined. This approach has been largely successful in delivering a balanced and broadly-based programme of inspections and, in the process, creating a clearer picture of the underlying issues and systemic improvements required across the asylum, immigration, nationality and customs functions for which the Home Secretary is responsible. The latest version of the plan covers 2019-20 only, as my five-year appointment as Independent Chief Inspector is due to end in April 2020. 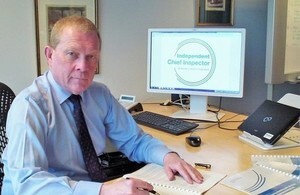 Deciding what to inspect and when is one of the most important aspects of the Chief Inspector’s independence. Therefore, whoever is appointed to take over the role will want to be free to determine their own inspection plan for 2020-21 and beyond. The updated plan for 2019-20 is informed by the inspections ICIBI completed in 2018-19 and in previous years. It also takes into account the views of Ministers, officials, stakeholders, and everyone who responded to my open invitation via the ICIBI website to say what they would like to see inspected. The plan comes with two important caveats. Firstly, the timing of some planned inspections will depend on events outside ICIBI’s control and their effects on the UK’s border and immigration functions, in particular the UK’s exit from the EU and the outcome of the Windrush ‘Lessons Learned’ review. The 2019-20 plan notes where this is a particular concern. The other key factor is ICIBI’s capacity. The plan is deliberately ambitious, reflecting the breadth of topics that merit attention. In order to cover every topic listed, ICIBI would need to be fully staffed throughout the year. In reality, while a number of new recruits are in the pipeline and further recruitment campaigns are planned, ICIBI starts 2019-20 with a significant shortfall in inspectors. As ever, this will mean some hard choices about priorities and some careful scoping of inspections to get the most value from the work that we do. Lastly, it is important to note that the published plan is not restrictive. I am therefore happy to receive further suggestions for inspection topics or angles at any time during the year.